Soundtoys is well known among engineers and music producers as one of the biggest names in plugins, and most notably for its time-based effect processors. 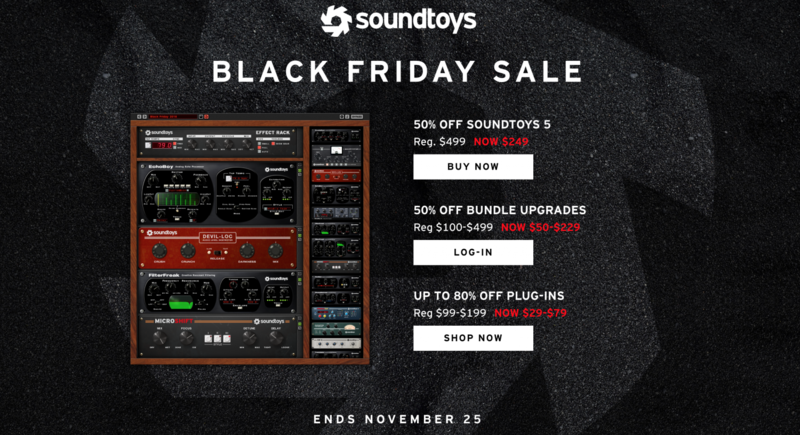 Among all of the companies coming forward with their great offers on their latest gear for Black Friday weekend, Soundtoys has absolutely put their best foot forward with savings this weekend that can make anyone’s jaw drop to the floor — guaranteed. 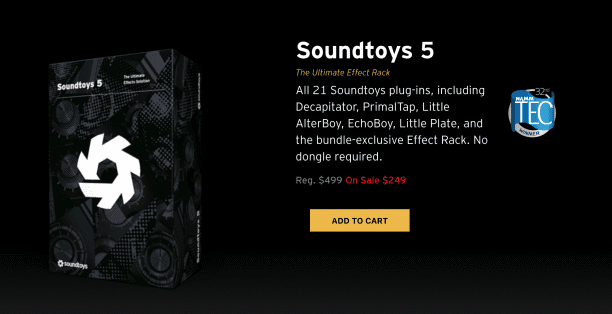 50% off of Soundtoys 5 plugin bundle, bringing a retail price of $499 down to $249. 50% off of bundle upgrades with login, slashing price ranges from $100-499 to $50-229. 80% off of single plug-ins from their online store bringing a range of $99-199 down to $29-79. All three of these exclusive offers are going to be available from today, November 21st through Sunday, November 25th — which leaves users a giant 4-day window to take full advantage. Although all of these are amazing price-slashing deals through Soundtoys, we believe out of all the one to snag before it goes away forever is the full Soundtoys 5 plugin bundle. Soundtoys 5 comes complete with ALL 21 plugins that Soundtoys has to offer on their website, leaving absolutely nothing out. After taking a look at that line-up for yourself, it should be no question that for just $249, this is absolutely an offer that gives other plugin companies a serious run for their money this holiday season. Make sure to head over to Soundtoys.com right now, (or at some point before the November 25th deadline) to fill your shopping cart and in turn, fill your DAW with one of the best toolkits in audio today.